Have you heard the term, adulting? If you are a millennial, I am sure you have but older bosses might not be so savvy. The term #Adulting is a hashtag – a social media thing and it is used often by millennials to indicate they did something an adult does, like their own laundry. There are a lot of experts out there who have had enough of the word. They believe it is actually self-demeaning for millennials (some almost 40 years old) to use it. My boss is an older Millennial who gives me a lot of responsibility at work. She trusts me to manage our interns, make sure reports are sent out to higher-ups, and that her schedule is always up to date. I’m not going to look capable of any of those things if I act like going to the grocery store alone is “adulting,” my biggest accomplishment yet. I want even more responsibility than I have now, and I’m not going to get there by acting like I need a pat on the back for brushing my teeth and showing up to work on time. At your firm, I hope you are always treating your millennials like adults. Talk to them about this topic. 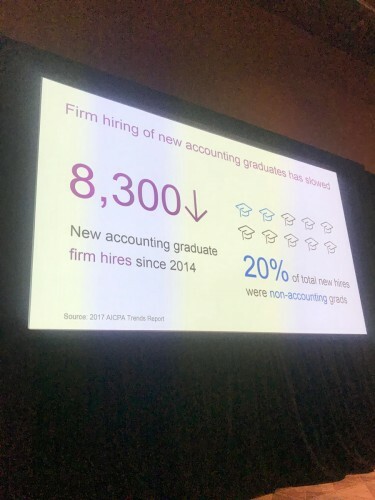 I am optimistic that most accounting degreed, younger professionals are already acting like adults. As I read an article via The New York Times – Your Workplace Isn’t Your Family (and That’s Ok! ), I definitely thought about how the article should be read by many of you working inside accounting firms. The article is an interview with Alison Green, author of a book titled: Ask a Manager: How to Navigate Clueless Colleagues, Lunch-Stealing Bosses, and the Rest of Your Life at Work. I have heard it over and over from firms of varying sizes over many years – “we are like family.” I have always struggled with this topic. I have seen it used to avoid difficult conversations and to justify continuing to employ a poor performer over a long period of time. I have also seen it used to make unreasonable demands like working unreasonable hours and even seven days per week. As you work at your accounting firm, always remember that this is business, not family, no matter what some people might think. From the author: I want people to know it’s all right to treat work like work. We’re being paid to be there, and most of us wouldn’t show up otherwise. We don’t need to pretend that’s not the case. Employment, underneath it all, is a contractual situation. It is a transaction: I pay you and you do the work. You pay me and I do the work. Be sure to read the article/interview. My friends at ConvergenceCoaching®, LLC, are committed to helping firms succeed through the adoption of NextGen strategies, including flex. They are seeking participants in their Anytime, Anywhere Work™ Survey 2018. The goal of this survey is to collect data on the adoption of flexible work programs (Anytime, Anywhere Work™ programs) by public accounting firms and the experiences firms have had with these initiatives. Follow the link to find out more and please consider participating in the survey. The survey is open through June 15. By participating you will receive a copy of the survey results. Young CPAs – Start Sooner! If you are not a young CPA – I hope you share this blog post with young CPAs. You are fairly new to your CPA career. You graduated with a history of good grades. You landed an entry-level job, right out of college, with a prestigious, growing public accounting firm. Major accomplishment: You passed the CPA exam and are now a twenty-something CPA – congratulations, you have the momentum going for you! You have been working on a variety of client engagements. You may be focused on tax and you may be focused on the audit side of things. You might be in a small to mid-size firm and have the opportunity to work in both areas and will probably soon declare your future focus. You are focused on the work. You are getting better and better at the work. It seems the partners are happy with your technical abilities and the way you complete the work. Don’t wait years and years to get started on this list. Learn the success skills as you are learning the technical skills. Life is short – get busy! Life is short and the older you get, the more you feel it. Indeed, the shorter it is. People lose their capacity to walk, run, travel, think, and experience life. I realize how important it is to use the time I have. Many of our staff are just looking for a job, not a career. They want to work 8:00 until 5:00, five days a week. Even while they are at work, they waste so much time on social media, texting their family and friends, and shopping on Amazon. Some partners send me emails at midnight. They also send me emails on weekends and sometimes at 5:00 a.m. I am expected to reply and it seems like I am on call 24/7. Technology enables us to do so many things more quickly. It also allows us to use a lot of time we should be working on personal endeavors or to intrude on people’s personal time inappropriately.